Logan Intl. - Miami Intl. There is much truth in his words, whether you’re venturing 30 or 3,000 miles from your home. Every step you take begins a new adventure, and every journey helps you come closer to the person you were destined to become. 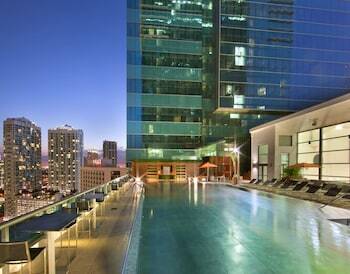 This trip is an important one, and you’re in good hands when you use Travelocity to book vacation packages in Miami. We’ll leave nothing to chance, ensuring your travel arrangements are secured in one convenient place, at the lowest possible price. 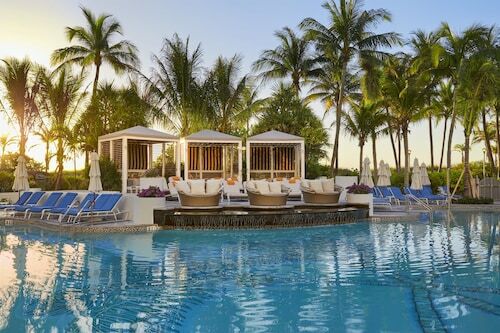 When you combine your flight and hotel in one of our Miami package deals, all that’s left is the fun part: being there. 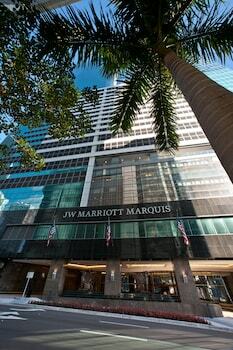 Miami vacations are the perfect opportunity to stretch your wings and seek wisdom in a new place. Each town, city, or region you visit has its own lore, and Miami is no different. Relax in a on the beach and watch the locals stroll by, or sip a cosmo and strike up a conversation with a resident. 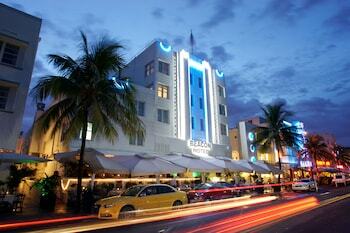 Ask them about their favorite part of Miami, and find out what lured them to this neon locale. Fontainebleau Miami Beach: Dance the night away with a stay at the Fontainebleau, which puts you near the middle of Miami’s famous nightlife scene. 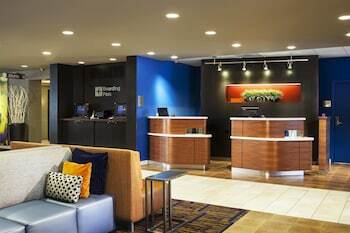 This hotel lies less than 2 miles from Interstate 195, and with four buildings that each house a separate type of accommodation, there’s truly something for everyone. Spend your nights in a sleek and cozy guest room, or stretch out in a spacious 2-bedroom suite. And if you appreciate a little pampering every now and then, elect to stay in a pristine penthouse. You can also unwind with a full-service spa treatment, or spoil yourself with some retail therapy in Miami’s nearby boutiques. 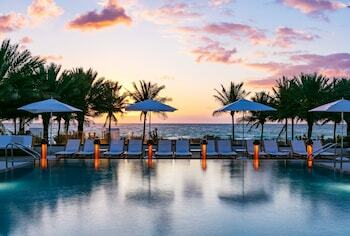 Eden Roc Resort Miami Beach: Shop till you drop at Eden Roc. Located a short drive from the bounty of boutiques on Lincoln Road, this high-class oceanfront accommodation invites you to get your toes wet in a captivating pool-side scene unlike anywhere else. With rooms ranging from the efficient to the extraordinary, you can choose how fancy you want to be. Gaze at the ocean view from your room, or grab a beach chair and head out into the sun. The four on-site pools let you take a dip at any hour of the day, while the resort’s numerous restaurants are eager to please your palate. Loews Miami Beach Hotel – South Beach: Create indelible memories your family will share forever at this posh resort on the city’s southern shore.. With an unbeatable location overlooking the ocean, this contemporary hotel lies less than 10 minutes from Lummus Park and Miami Beach Golf Club, affording you the freedom to stroll through the city’s scenic grounds or perfect your putt at your leisure. Thrill your taste buds at any of the multiple on-site restaurants serving seafood, dim sum, and Mediterranean dishes, and ensure your kids have the time of their lives by signing them up for the hotel’s own day camp. 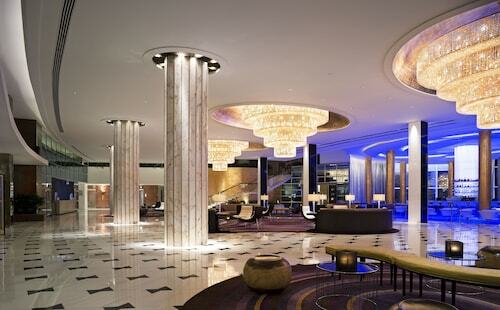 The Ritz-Carlton, South Beach: If you live for the finer things in life, look no further. Founded in the 1950s, this posh hotel is less than a 10-minute walk from Lincoln Road Mall, and about the same distance from the Bass Museum of Art, giving you easy access to some of Miami’s top attractions. Kick back in finely adorned rooms and suites with marble accents, or live it up in larger quarters featuring a kitchen, balcony, and access to the executive club. Before heading out for some salsa dancing, treat yourself to a meal at the Ritz-Carlton’s oceanfront eatery serving seafood and steaks, or settle in at the Spanish-American bistro for a more exotic entree. Ready to schedule your trip to this tropical treasure? 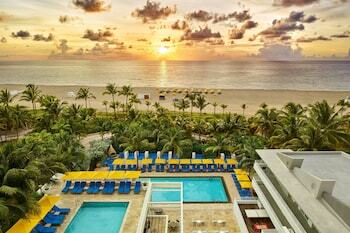 Travelocity offers the easiest way to book a vacation package in Miami, FL at an incredible price. And by bundling your travel arrangements, you can enjoy a cheap vacation in Miami that feels like you’ve spared no expense. With everything taken care of, it’s never too early to start your vacation countdown. Enjoy the journey, traveler. We’ll see you there. 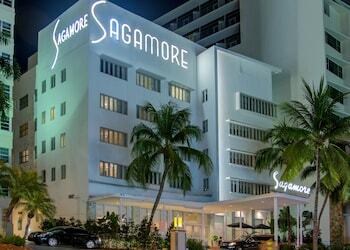 Need insider tips on must-see attractions in Miami? 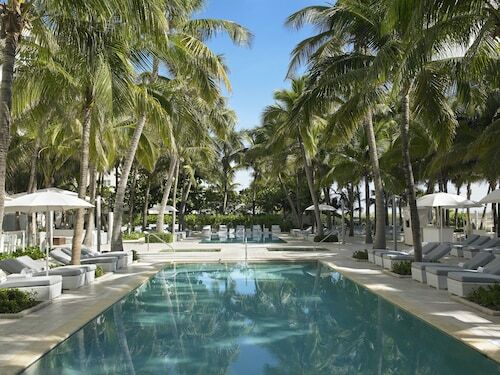 Check out our Miami travel guide! Say hello to sunny Hialeah, Florida! Once you're here, you won't want to leave this tropical paradise located just west of Miami. With a slower pace and variety of entertainment, it is a great place to visit if you're really looking to unwind. If you need a break from it all, Hialeah vacation packages provide the best remedy. If you're in the mood for a sun-soaked holiday this year, start looking into Miami Gardens vacation packages! The city is a suburb of Miami, Florida, and lies in the north-central part of the county, easily accessible via highway and the airport. 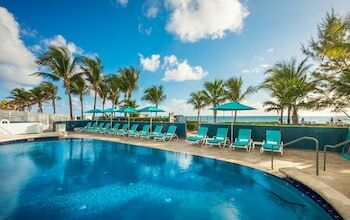 Miami Gardens vacations offer a great opportunity to escape to the sun and surf for a little while and maybe even take in a Miami Dolphins football game or check out one of the cool casinos in the area. 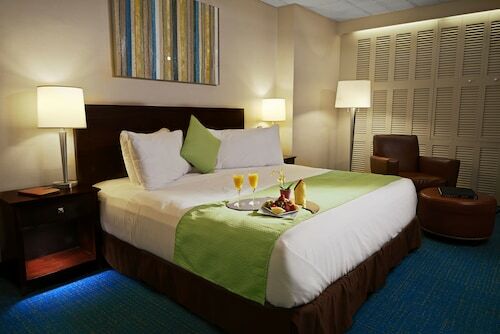 You can look for cheap hotels in Miami Gardens that are close to the area's best attractions to make your stay a success. U.S. dollars (USD) will buy you a piña colada, mojito or anything else you fancy in Miami. What is there to do in Miami? What is the best place to stay in Miami? Described as trendy, fun and the center of Miami nightlife, South Beach is roughly 4 miles from the downtown area and the place to be if you love living it up after dark. From cocktail lounges and dive bars to dance clubs and jazz venues, there are so many places to get your groove on. This is another bustling and vibrant area boasting luxury hotels and upmarket restaurants. With an impressive collection of museums, theaters, historic landmarks and show-stopping attractions, this place really does cater to all interests. What is Miami famous for? Vizcaya Museum and Gardens is a must-do in Miami. Tourists come from all over to wander through this historic estate. Miami Seaquarium is a renowned aquarium and the perfect place to take the kids when they’re getting restless. 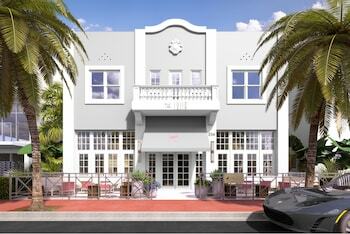 With some top-notch restaurants and retail stores, Lincoln Road Mall is the place to give your credit card a work out. Located in Downtown Miami, this apartment building is within a 5-minute walk of Downtown Miami Shopping District and Bayside Marketplace. American Airlines Arena and Bayfront Park are also within 15 minutes. College-Bayside Metromover Station and Freedom Tower Metromover Station are within a 5-minute walk.